I had an eye-opening moment yesterday morning. While his baby sister had her morning nap, my 4-year-old son asked me to paint his fingernails. I thought nothing of it, and grabbed my bag of assorted nail polish and told him to choose some colours. I have painted his fingernails a few times before, usually when I’m painting my own and he wants to be included. But that’s not where the eye-opener happened. It happened later, when we left the house, and his fingernails were on display in front of the public eye. He was judged. I could see it. I could see it in the raised eyebrows, the questions, and the appeasing smiles and nods. I hope he didn’t see it too. But, then again, I know he didn’t see it. He didn’t see it because he’s too young to understand it. Children are born without negative judgement or criticism, and are filled instead with complete acceptance, pure innocence, and absolute naivety. It makes me wonder: why is it such a big deal that a 4-year-old boy has painted fingernails? Why is it even questioned? 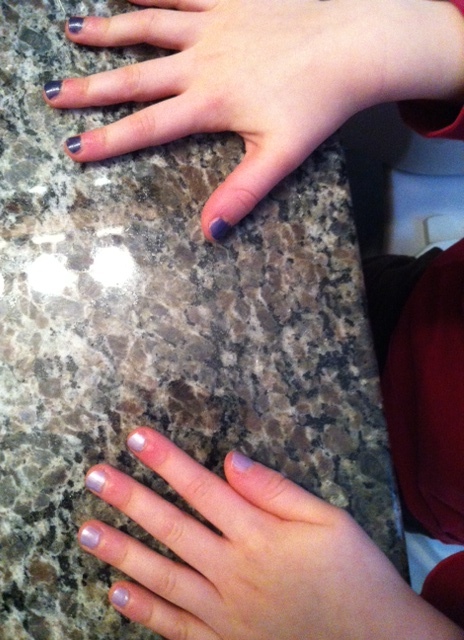 Any parent can tell you that children model behaviours seen at home, including mundane things like fingernail painting. He wanted his fingernails painted because he thought it would be fun. Simple as that. And if he wants to play with dolls and wear pink clothes, then I will let him, because it’s fun. Just like I will let my daughter cut her hair short and play with trucks and wear blue clothes. If she wants to. If it’s fun. But what about teasing? I wouldn’t want him to be teased by other kids, would I? Well, who would he be teased by? By those who have not yet learned acceptance? You teach them acceptance by accepting them. It starts at home. It starts with me painting his fingernails. It continues with me asking him if anyone at his Nursery School mentioned his fingernails. It ends with me explaining that different people like different things and it’s okay to be unique. Celebrate differences, don’t judge them. Here are the cute little hands in question. This entry was posted in Opinion, Parenthood and tagged acceptance, children, fingernails, judgement, raising kids. Bookmark the permalink. I did the same, I got flack from people too. Sam is almost 16 and comes home from his girlfriends house with nail polish on and I don’t care. If our children are happy, free spirits they are more confident to make their own choices ideally. Great article Ashley! Ash I paint Hayden’s fingers and toes all the time (we did a special manicure for preschool pictures even) and so far no judging that I’m aware of, just kids comparing colors and nail stickers! My only issue is he only ever wants OPI when I try to suggest the cheap stuff! Go Drew go! Show off those colorful fingers! Good for you, Ash! Your kids are lucky you’re their mom! I have this same problem and I work with other women! I paint my sons toe nails before I put on his eczema cream, I also do it when he brings me the polish just because he wants to. My son is two and I work at a daycare I cannot tell you how many times other teachers have come up to me giggling about my little boys toes! He also wants his hair done in the morning and wears a very nice fedora (my kid is classy) hat to school everyday. It drives me crazy that he gets raised eyebrows and whispers from other parents and even some teachers. Dressing up is fun! And good for you for allowing your son to express himself without telling him “No only girls do that,” both boys and girls love colors and should be allowed to express that in any way THEY deem fun without society judging them. Agreed Lindsey! Let kids be kids, and for that matter, let people be people!